The background is looking nice and bright. So it is time to move on to the body of the bird. Remember, save the details for last. Just get the base painting in. You can always tweak and add the little things later. We used Aureolin Yellow, Winsor Red, and Permanent Alizarin Crimson for this wash. Be sure your paper and previous wash is bone dry and your pigment colors are moist and ready to dip into - but not too wet to control the pigment to water ratio. 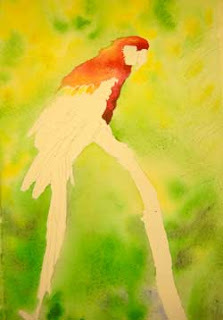 Painting on dry paper, begin to load your brush with a nice creamy mixture of a pigment. Just as you would paint a flat wash, keep the edge of the wash wet with a bead of wet paint. As you move around the body of the bird, continue to dump, charge or mingle the other colors. The mixture should be wet enough to stay moist, but not so wet as to dilute the colors too much. Do not brush back and forth, rather just drop the colors where you want them to go. Darker colors in shadow areas or where the feathers look darker and lighter colors where the light is hitting the bird or where the actual feathers are more yellow. This technique is often called Charging or Mingling.